Regular readers of this blog know that the central pieces to the Fundamentals System are defining a set of behaviors you want to see (we call them Fundamentals) and the systematic practicing of them every week through the use of rituals. In this post, I’d like to take a closer look at one of those rituals and offer some tips for doing it more effectively. Limit the discussion to no more than about 5 minutes. Why? Because we don’t want to take so much time that we don’t get the chance to cover the other items on our agenda. If you keep running out of time on the agenda or the meeting keeps going too long, you’ll likely stop covering the Fundamental. It’s better to talk about it in every single meeting, but keep it briefer. And you can always invite those who have more time to stay after the meeting to continue the Fundamentals discussion then. Get people engaged by asking thought-provoking questions about the Fundamental. Rather than lecturing about it, or asking, “Does anyone have anything you’d like to say about this?”, ask questions that get people thinking. “Why do you think many people struggle with this Fundamental?” “What’s the most challenging part of this Fundamental for you?” When you get people engaged, and make it interactive, it stays fresh and interesting and people learn more. And that’s the whole point of the discussion. Rotate who’s leading the meeting. At first, it’s best to have the leader of the meeting kick off the discussion. However, after awhile, it’s very powerful to ask others to lead the discussion. Note: It’s important to give them advance notice since most people aren’t that comfortable when put on the spot. “Tom, I’d love it if you could lead our discussion of the Fundamental of the Week in next Tuesday’s sales meeting.” When others lead the meeting, their ownership of the Fundamental goes up significantly. The reason that this ritual is so valuable is that it gives us a systematic opportunity to teach the Fundamental many times throughout the week. In the absence of this ritual, our teaching is limited to being “episodic.” In other words, the only time we get to teach about it is if a relevant situation arises. This ritual creates regular opportunities to teach that wouldn’t otherwise have happened. 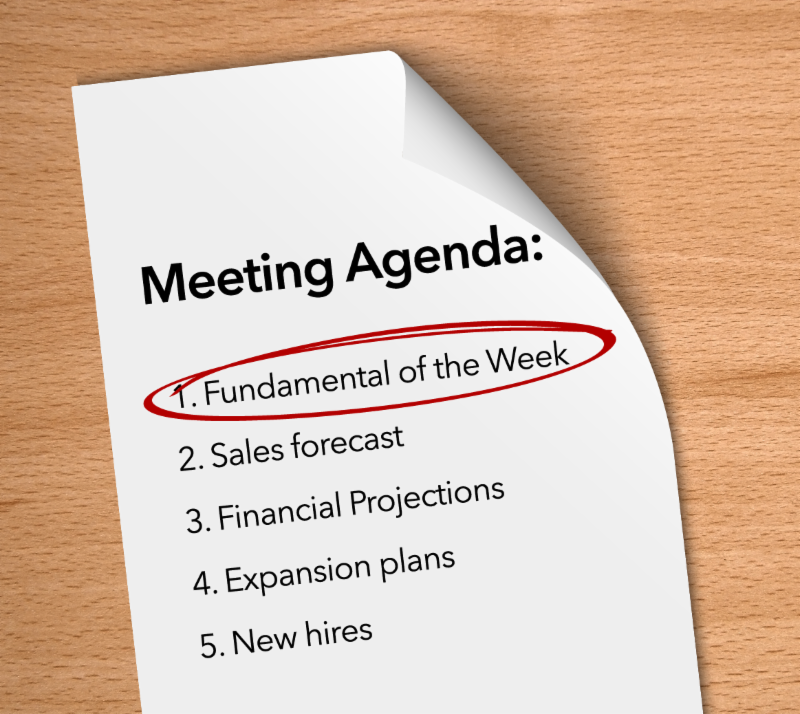 Here’s a simple tip for making sure you remember to start the meeting with the Fundamental of the Week: Every meeting should have a written agenda. Simply create an agenda template that everyone uses for all meetings. The first item on the template is the Fundamental of the Week. Easy! By the way, believe it or not, most of our clients even start customer, prospect, and supplier meetings with the Fundamental of the Week! While I know the impact from my personal experience, it’s always fun to hear them tell me what happened when they first tried this. Virtually every time they report that the customer, prospect, or supplier was blown away and wanted to talk more about the Fundamentals. And many have landed big new sales because the prospect was so impressed with how they were using their Fundamentals. If you’d like to learn more about how to put the power of the Fundamentals System to work for you, just give us a call or shoot us an email.